Cristiano Ronaldo's departure will be judged on bigger games than this but Karim Benzema and Gareth Bale continue to provide the smoothest of transitions after each scored in a 4-1 thumping of Leganes on Saturday. Benzema grabbed a double in the second half and might have sealed his hat-trick had Sergio Ramos passed on the penalty he scored after a foul on Marco Asensio. Bale had earlier broken the deadlock with a smart half-volley, which was briefly cancelled out by Leganes' Guido Carrillo, who converted his own spot-kick to ensure Thibaut Courtois' first Madrid contribution was to pick the ball out of his own net. Rejuvenated under their new coach Julen Lopetegui and, perhaps, liberated by the absence of Ronaldo, Bale and Benzema sizzled again at the Santiago Bernabeu, with Bale now owning three goals and Benzema four from the first three La Liga games of the season. Shortly before the final whistle blew here, it was impossible not to note that a third Juventus match has now passed, a victory over Parma in Serie A, without Ronaldo finding the net. Real have also taken maximum points from their opening three fixtures, a feat not to be overlooked given this time last year they were already five behind Barcelona. Leganes' underwhelming start under new boss Mauricio Pellegrino continues. They are yet to post a victory. Keylor Navas was named last season's best goalkeeper by UEFA on Thursday but was only deemed second choice here by Lopetegui, who handed Courtois his debut after joining from Chelsea earlier this month. Luka Modric took the place of Isco, in a midfield three with Casemiro and Toni Kroos. Bale and Asensio supported Benzema up front. Real's confident start saw Asensio skip in behind but his lifted finish floated just over, before Bale's cross was too quick for the straining head of Benzema at the back post. The first goal came after Ramos' pass found Dani Carvajal as the furthest man forward and the full-back's clever header back towards the penalty spot wrong-footed everyone except Bale. The Welshman arched his right leg over the bouncing ball, his finish just enough to beat Ivan Cuellar. Real looked in control but, against the run of play, Leganes earned a lifeline when Casemiro tripped Javier Eraso in the box. Carrillo sidefooted left as Courtois dived right. 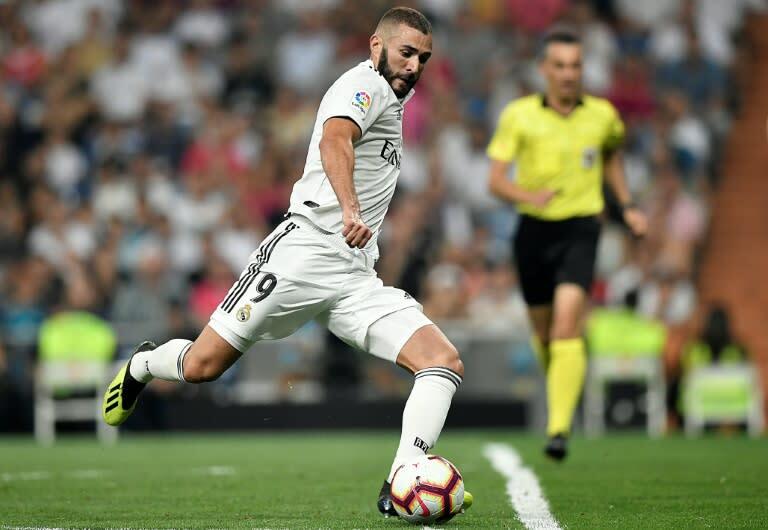 Benzema was unlucky to restore the lead when his fired shot was denied only by the foot of Cuellar but the striker did not have to wait long. Three minutes into the second half he headed in Asensio's cross from the left after winning a tussle with Leganes' Jonathan Silva. Referee Jaime Latre initially blew for a foul but, after consulting VAR, the replay showed Silva had been the aggressor and the goal stood. There was no doubt about Benzema's second. He exchanged a one-two with Modric on the edge of the area and, drifting right, dragged his shot left, back across goal and into the bottom corner. He might have had his hat-trick had Ramos opted to delegate penalty duties after Asensio fell over a thoughtless challenge from Leganes captain Unai Bustinza. But Ramos took the spot-kick and made no mistake.